And now, more #McHaleAPalooza stuff beneath the break! Kim and Jaime live in New York City, and I am insanely jealous of that fact because - let's face it - pretty much everything cool happens in NYC. Perusing Tumblr one morning at work (yes, I am VERY productive, in case you couldn't tell), I happened to notice that Joel would be in the city for a one-night only stand-up show at Caroline's on July 25th. I remembered from Kim discussing it before that this is where he had performed the first time she got a chance to meet him. So, like a good friend, I tweeted out the information and Kim and Jaime purchased their tickets to the show. Of course, one of the things that happened recently, as you are all aware, were Emmy nominations. And (again, you are all aware of this fact) both Community as a show and Joel as an actor were snubbed. But, let's face it -- Joel deserves SOMETHING for all of the work that he puts into the show (and puts into life in general: being a dad, husband, stand-up comic, host of The Soup, star of Community and movie actor), so we decided that he deserved to have his own award. And really, what better award could we offer to him than a "Most Handsome Young Man" award (which, adorably, Jaime said he didn't quite get at first until they reminded him of "Contemporary Impressionists"). Obviously, we needed to find ourselves a trophy to give him. But we wanted to do more than that. There is something really special about the fact that Community as a show is about a band of seemingly completely different individuals who form a tight-knit bond with one another and it actually managed to do the same thing for an online community -- I've met so many amazing individuals thanks to the show. And it's not just the fact that we watch the show together weekly (because we do). But whether we're going through family losses, personal struggles, work drama, engagements, weddings, births of babies... we are all there for each other. Somehow, Dan Harmon managed to create a literal community and I'll forever be grateful to him for the people he's brought into my life because of it. Sentiment and sap aside, the three of us knew that we had to open the floor up to others who wanted to express to Joel the same thing that I just did above. So we drafted up e-mails to about twenty or so people in our "study group" and sent them a template for a cute little tag. 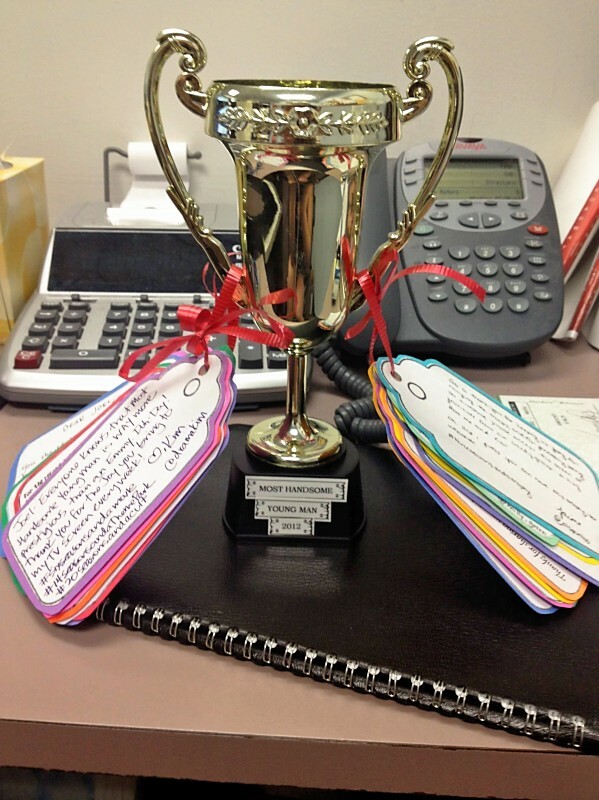 Our idea was to scan in the tags with everyone's messages to Joel, print them out on colored cardstock, and tie them to the trophy with a ribbon. Cute idea, no? And (as evidenced from the photo above) Kim did an amazing job with it! So we brainstormed where a good place to find a trophy would be, having not too much luck with the Dollar Store, and I suggested Party City. Let me just say that whenever I had to plan anything for a sorority event, it was ALWAYS Party City/Michael's trips that made the events happen. ;) Kim found two adorable trophies and we decided on a traditional-looking one with handles so that the tags could get tied. This past weekend, tags started rolling in and... well, I'll post pictures (courtesy of Kim!) to show you what we received. I literally -- LITERALLY -- started tearing up as I read them. I think what I love the most about the tags is that they are SO reflections of our personalities. Half of them are lighthearted and joking, and the other half literally are sap-filled and make me want to melt. And really, I cried last night thinking about how beautiful and weird and special this group of people truly is. And as you saw by the picture at the beginning of this entry, the tags were affixed to the trophy and placed into a nice bag in order to give to Joel. So what exactly happened after the show? And why am I insisting on using the hashtag #wonderfulandcreepy to describe everything from here on out? Well, the next bit is a recap from Jaime on what happened last night. Jaime and Kim (and Sage and Michelle and another friend of Kim's) all got to Caroline's last night pretty early so that they could get good spots for the show. And, according to Kim (and I already knew this from seeing a video of his stand-up routine from last year's Gator Growl) apparently Joel likes to flail about stage when he tells jokes. I think it's adorable. When he finished and walked off stage, Jaime apparently got to touch Joel's hand which, you know. In her words: "No big deal." Kim and her friends had met Joel after the show a few months ago because a street cleaner told them where he was likely to come out afterwards. That time around, they waited at two potential spots outside for him to arrive, and this time, the little study group had a few tagalongs who followed them to their secret Joel-meeting spot. A little before 11, I got a text from Jaime freaking out because they just met him and got a picture with him. Poor Joel was in a HUGE rush though, and instead of just refusing to take photos and walking away, he instructed the tiny group to walk with him and took pictures with everyone there. That's why he wins the most amazing person award, consistently, by the way. Somehow, Kim managed to walk right beside him and hand him the present, explaining that it was "from his Twitter family." And his response? He said that it was wonderful and creepy, but then seriously said: "No, seriously. This is so great. I can't wait to read all of these." And he just kept saying that he couldn't wait to read all the tags. Which, you know... solidifies the "most amazing human being" award thing. Again. We're going to plan everything together in the future from here on out. Just so you all are aware. "Somehow" I managed to walk next to him. Ha! ... that's how I saw it. "Somehow" was also me screaming at Kim to RUN because she was the one with the present and if none of the rest of us got to see him she had to! ;) A great evening and a great recap! I mean...I once INFAMOUSLY shoved a child aside to get on an escalator behind Atlanta Brave Chipper Jones. I do NOT mess around. And that's why I am awesome. Awww you're more than welcome! Thank Jaime for filling in all the gaps of last night. ;) Everyone has said what a lovely person Joel is, both inside and out, and it just makes me happy to know there are celebrities out there as down-to-earth as he is! I love this, and all of you (and Joel, obvi) SO VERY MUCH.